We present the interpolation search tree (ISB-tree), a new cache-aware indexing scheme that supports update operations (insertions and deletions) in O(1) worst-case (w.c.) block transfers and search operations in O(log B log n) expected block transfers, where B represents the disk block size and n denotes the number of stored elements. The expected search bound holds with high probability for a large class of (unknown) input distributions. The w.c. search bound of our indexing scheme is O(log B n) block transfers. 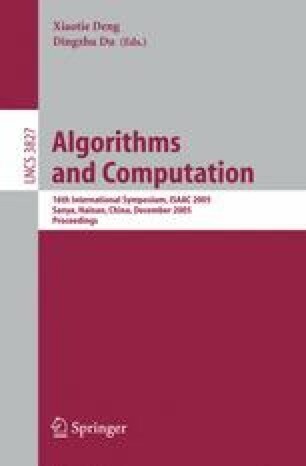 Our update and expected search bounds constitute a considerable improvement over the O(log B n) w.c. block transfer bounds for search and update operations achieved by the B-tree and its numerous variants. This is also suggested by a set of preliminary experiments we have carried out. Our indexing scheme is based on an externalization of a main memory data structure based on interpolation search. This work was partially supported by the IST Programme (6th FP) of EC under contracts IST-2001-33058 (PANDA) and IST-2002-001907 (integrated project DELIS), and by the Action PYTHAGORAS of the Operational Programme for Educational & Vocational Training II, with matching funds from the European Social Fund and the Greek Ministry of Education.